The human species has long lived on the edge of starvation. Now we produce enough food so that all 7 billion of us could eat nearly 3,000 calories every day. This is such an astonishing transformation as to verge on the miraculous. The Big Ratchet is the story of how it happened, of the ratchets—the technologies and innovations, big and small—that propelled our species from hunters and gatherers on the savannahs of Africa to shoppers in the aisles of the supermarket. To some, these technologies are a sign of our greatness. To others, they are monuments to our hubris, as each new innovation has created new opportunities for disaster. MacArthur fellow and Columbia University professor Ruth DeFries argues that this debate—played out every day between technophiles and environmentalists— is the wrong one to have. This cycle of crisis and growth is the story of our species, and understanding this pattern explains not just how we reached this point in our history, but how we might survive and thrive in millennia to come. "Is there a tale more astonishing and improbable than the human story? Lurching between triumph and catastrophe, humankind has transformed itself from a run-of-the-mill forager on the African savanna into a species that dominates every corner of the planet. Now, as our numbers surpass 7 billion, Ruth DeFries shows how our remarkable past can serve as a guide to thinking about our uncertain future. 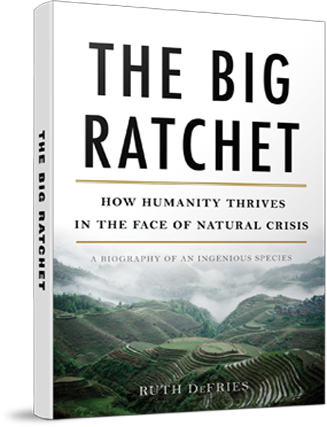 Neither a hymn to optimism nor an invocation of catastrophe, The Big Ratchet is an essential account of how we got to be where we are." "A page turner and an eye opener, clearly written and well told. If you are alive today, especially if you live in a city, this is the story of how you got here and why you eat what you eat. DeFries deftly guides us through our species' unending quest to squeeze more food out of the earth, introducing us along the way to buffalo bone pickers, ancient plant breeders, guano wars, the extinction of the Rocky Mountain Locust, medieval human poop tradesmen, Arctic "doomsday" seed vaults and the Nobel Prizes awarded to the inventors of DDT and trans fats. A fascinating history of human innovation." "Timely…Clearly demonstrates the role of science in converting calamities into opportunities. The Big Ratchet provides a message of hope in the midst of the sea of despair we see in the areas of sustainable development and environmental protection. Ruth DeFries has rendered an invaluable service." "An admirable history of human ingenuity that does not claim it will overcome such looming crises as overpopulation and global warming." "DeFries places her faith in human creativity as a primary means to our survival, an appealing point of view for the hopeful but concerned reader." "DeFries unpicks the historical patterns to parse the uneasy equation of people and food — our most powerful link with nature." "At its heart, The Big Ratchet is a food book, deserving a place on the shelf alongside work by the likes of Michael Pollan, Mark Bittman, and Marion Nestle that criticize our modern system of industrial agriculture."